O2 Apollo Manchester (formerly Manchester Apollo) is a concert venue in Manchester, England. Locally known as The Apollo, it is a listed building, with a capacity of 3,500 (2,514 standing, 986 seats). O2 Apollo Manchester was originally built as a cinema in 1938, which later became ABC Cinema Ardwick. It was designed by architects Peter Cummings, Alex Irvine and R. Gillespie Williams. Its original purpose was as a cinema and variety hall. It was opened by 1930's actress Margaret Lockwood. Right up until the 1970s, the venue continued to provide the same service to the public, until the cinema industry declined and the variety side of the venue took over. It focused its resources on becoming a leading concert venue competing at that time with the likes of Maine Road. Many famous names in music and comedy have appeared at the venue. It also hosts seated events to a capacity of 2,693. Split into two levels, the upstairs contains permanently fitted seating, whereas the larger downstairs can be altered to suit the event; both levels view a single concert stage. The venue has no air-conditioning except in the "Whiteroom" hospitality area, accessible only to holders of a Whiteroom credit card. The venue hosts a large number of popular music-based concerts and other events throughout the year and is one of Manchester's leading concert venues. Recent years have seen successful bands perform at both the Apollo and the MEN Arena on differing dates to create different atmospheres and reach different audiences. It has a distinctive red ceiling and raked floor giving an excellent view of the stage from anywhere in the auditorium. Merchandise is sold in the lobby. There are three bars, two on the ground floor and another on the second. 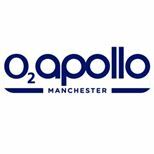 On 1st January 2009, the venue was rebranded as the O2 Apollo Manchester. In September 2012, the O2 Apollo Manchester will venture back into the cinema business but will keep its music venue and open a digitally-equipped cinema screen next door to the O2 Priority Room. The nearest rail and tram station is Piccadilly. Mini cabs and black cabs are available. There are frequent buses from the city centre to the venue: 192 / 201 / 203 / 204 / 205. There are two car parks immediately adjacent to the building both priced 5 pounds. The larger one on Apsley Grove has an overflow car park. The smaller car park on the Hyde Road side of the building caters for disabled patrons with a limited number of spaces used on a first come first served basis. Any patrons requiring wheelchair bookings should call the venue on 0161 273 7785 or email o2apollomanchester@livenation.co.uk. Please note only the stalls and not the circle is wheelchair accessible. Please contact the venue directly to see if a particular show is suitable for assistance dogs.